Over the past month or so, I’ve been alluding to a smaller “surprise” project we’ve been working on. It’s our fireplace! 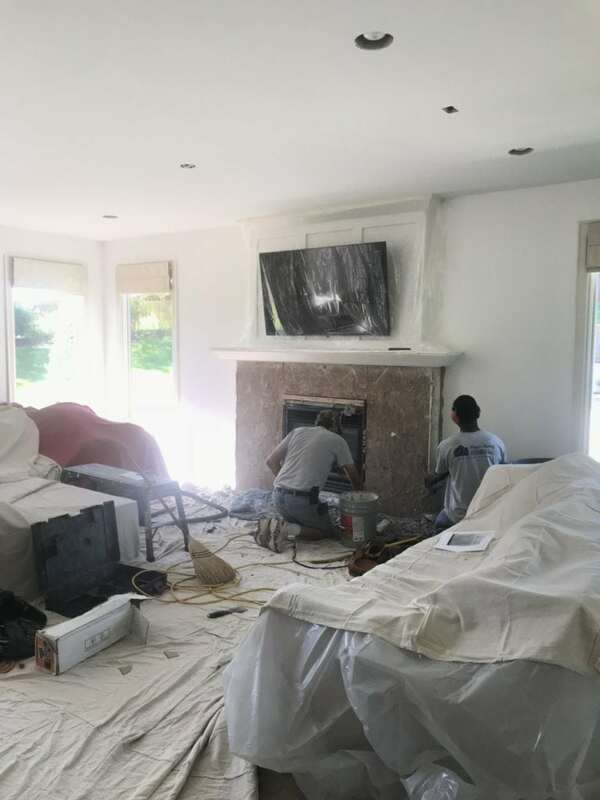 During the kitchen bidding process, I talked to the carpenter who worked on installing all our windows about the possibility of simplifying our fireplace and mantle situation. I knew once our kitchen was done, the existing stone would stick out, and I didn’t want it to detract from the kitchen. When the bid came back, we realized it made much more sense to just do the project while the guys were here and while we were in the middle of the mess. It’s funny how these things start to spiral 😉 But, I can happily say the old fireplace stone is gone, and our new one is nearly finished! But before I show you my inspiration images, let’s take a look back at our old fireplace. 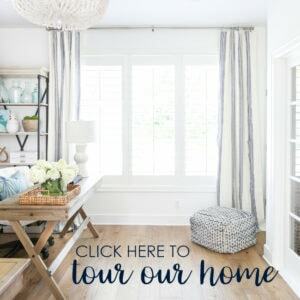 Our living room has undergone several transformation since we first saw the home back in 2012. Here was how it looked during our first showing. 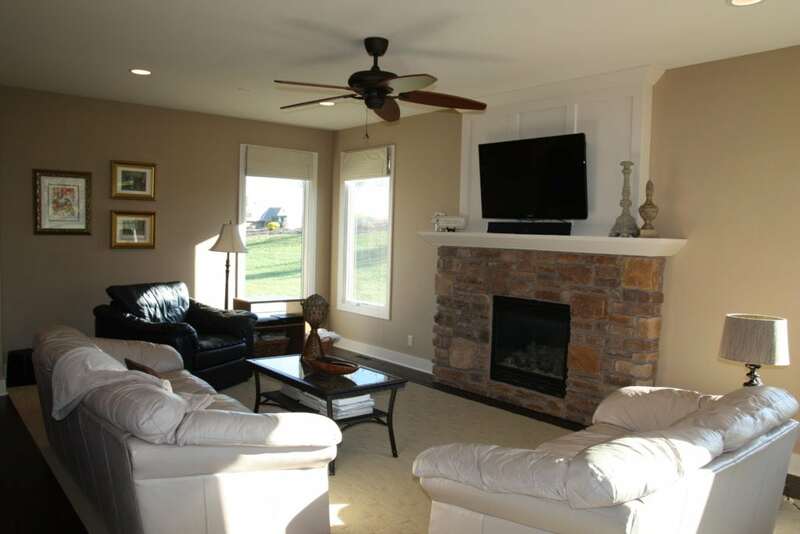 You can see the stone veneer in it’s natural color (which is also the same stone on our exterior). 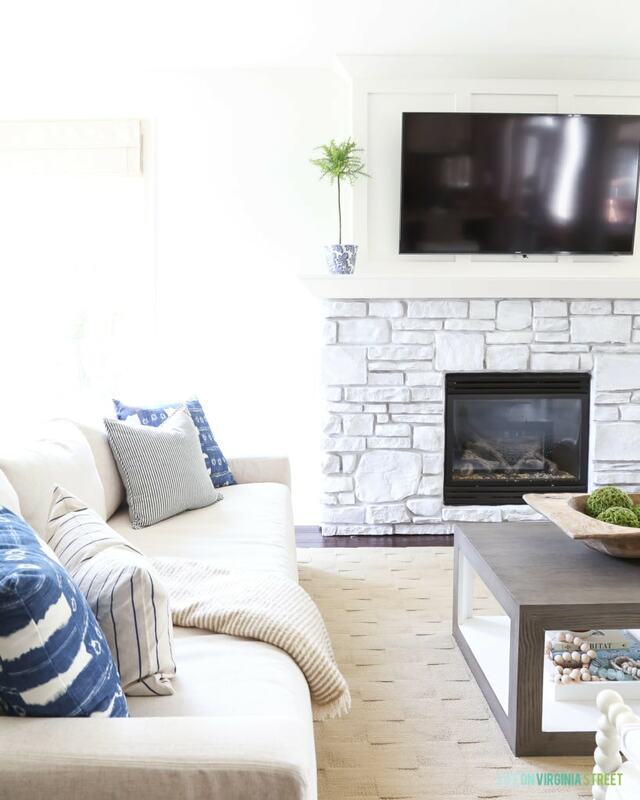 It didn’t take long for me to realize the dark, saturated stone was hard for me to decorate around, especially once I had lightened up the walls a bit. 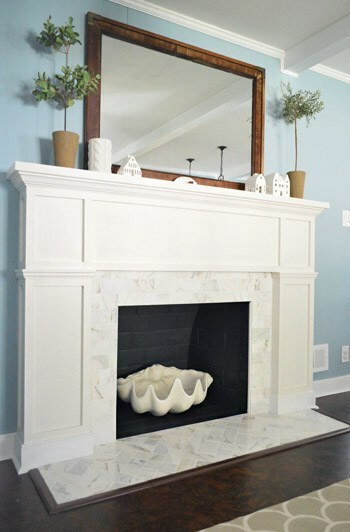 So, within the first nine months of living here, I gray-washed the stone fireplace with chalk paint. Then, about seven months after that, I realized it was too gray and added a light whitewash over the stone. It stayed that way for the last four+ years, and was a great temporary solution to make the room feel brighter. The chalk paint has held up perfectly over the years, but it was hard to get the exact color I had wanted and it just felt “off” and too cool. I also felt like the stone just didn’t fit with the rest of our home. 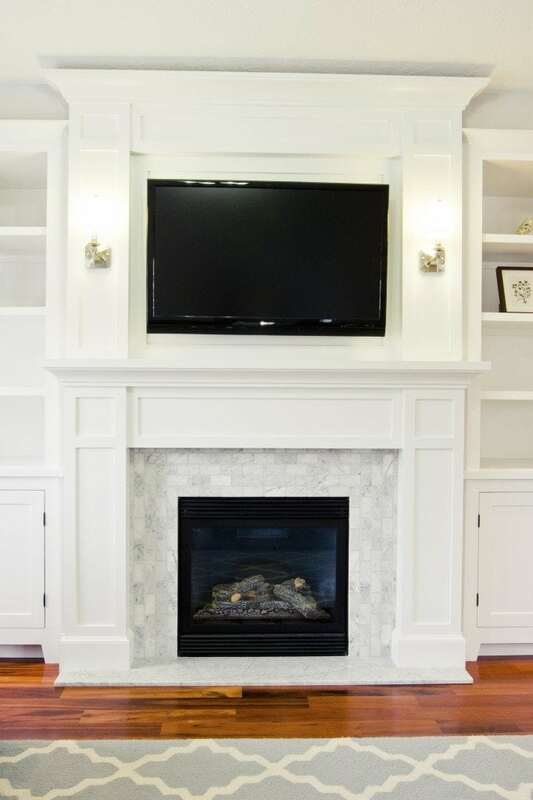 So, with that, while we were in the mess of all the kitchen construction, we decided to move forward with a new fireplace that would better flow with the rest of our home. 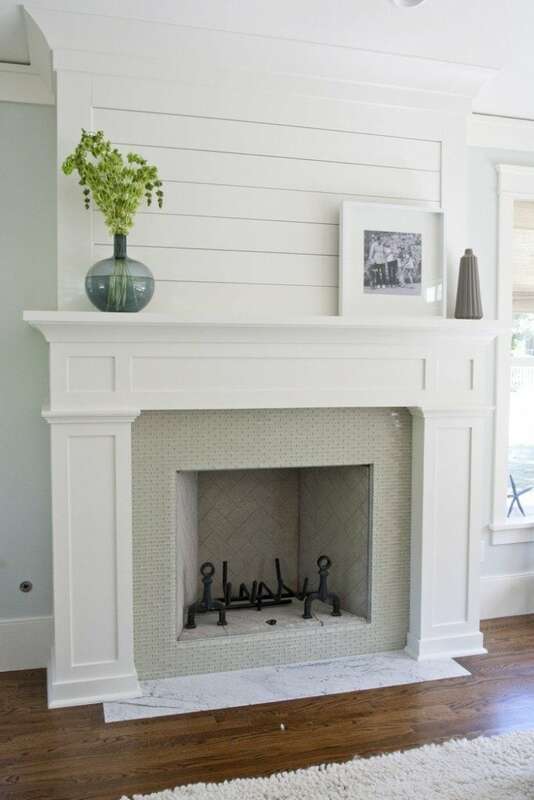 We knew we wanted the upper elements of our fireplace to remain (with the board and batten) but then incorporate a shaker style fireplace mantel on the lower half. Overall, we wanted to simplify the entire look. I felt like that design would work best with the new shaker style cabinets in the adjoining kitchen. Following are some of the images I gave to the carpenter. While my family was visiting the week of the 4th of July, the guys came in and did the demo. 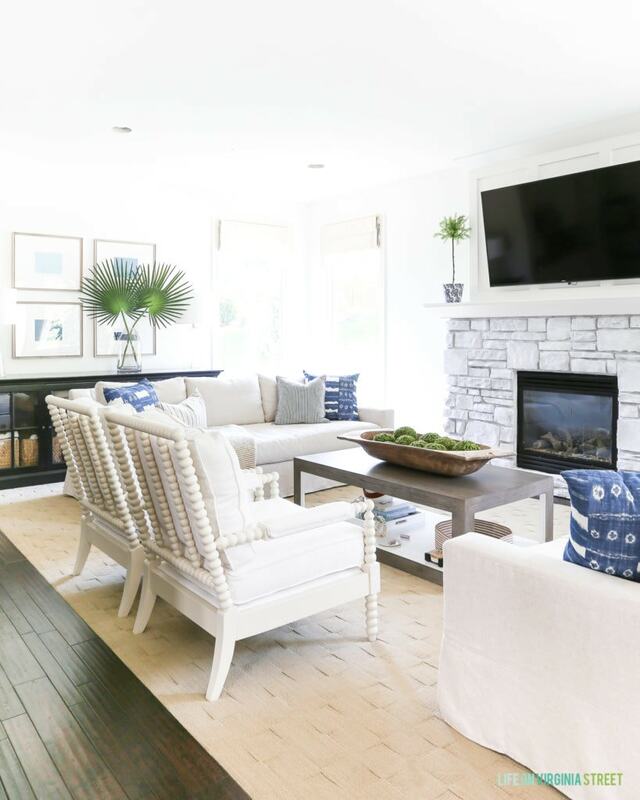 It was one of the messiest projects of the whole renovation. They had to jackhammer the stone veneer off, and while the stone was relatively contained, the dust was everywhere. It took them about a day and half of demo and then to rebuild the wood frame and shaker details. Here’s a progress shot before they started to re-build. The project is actually 90% done at this point (yay! ), and I’m just finalizing my tile selection for the inset! Following are a few of the samples I brought home. The two on the outside are from The Tile Shop and the one in the middle is from Lowe’s. I’m hoping the full project will be wrapped up in the next week or two and I can share the results with you then! But, I can already tell you, even with no tile, it’s gorgeous and a 1000% improvement! Can’t wait to share with you soon! Lovely! I’m a nut for herringbone, but my eyes keep going towards that basket weave. May have to steal that tile idea. Looking forward to reveal day! I check everyday. I have a smaller pantry project going on that has taken a while, and I’m ready to be done! Tired of all my thoughts being about a pantry. ugh! Oh wow, it will look so different and amazing. I had often wondered on your stone choice. It just always seemed off in terms of the rest of your decorating. Glad you clarified that it was existing and then chalk painted. I think the direction you are going now will look super. 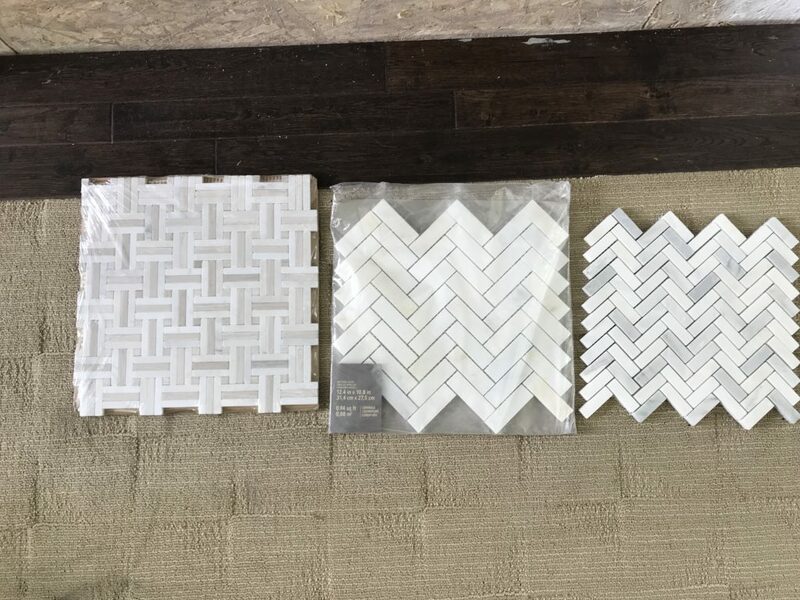 Any of the three tile look good to me but for some reason I like the center one best. I think because it isn’t overly busy. Excited for the reveal! It’s gonna be great! Wow! You guys are on a roll! So many projects getting done in a matter of months! You must have stashed a hunk of a change to tackle them. I can’t wait to see them all finished. 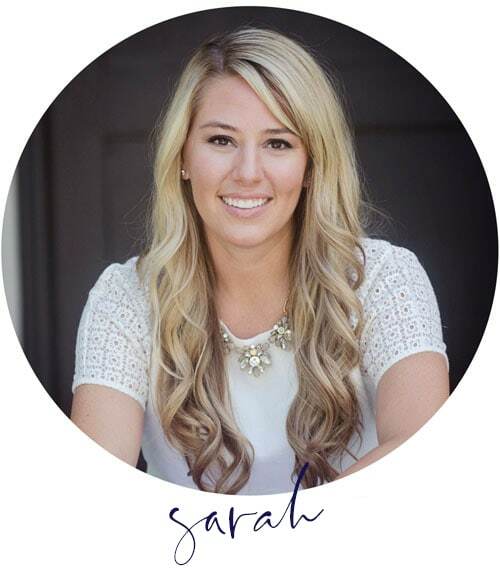 This is going to be so beautiful Sarah! 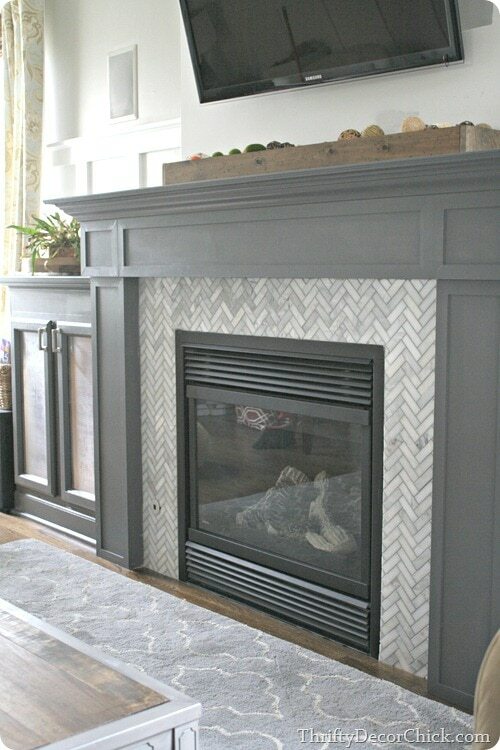 I used the middle herringbone mosaic tile on my hearth and still love.love.love it…one of my favorite projects to date. Can’t wait to see yours when it’s done! I really like that Lowe’s tile! Oh my Gosh I watch your insta stories and love you choice!